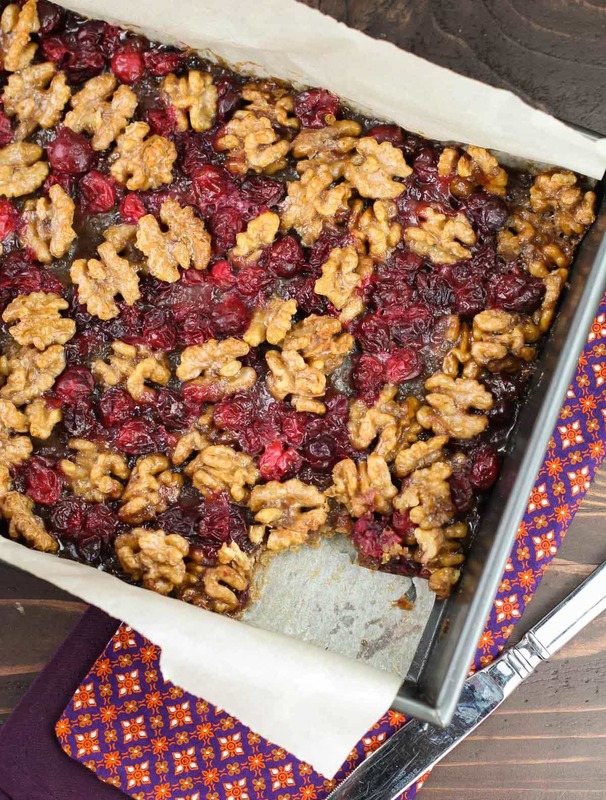 These Cranberry Walnut Bars are one of our family favorite food gift recipes during the holidays! I first made these Cranberry Walnut Bars years ago as part of a basket of homemade food gifts for Pat’s work friends. (It was one of those recipes I actually cut out of the newspaper way back when!) Everyone asked for the recipe, and I knew we had a hit on our hands. One bite, and you’ll know exactly what I’m talking about. 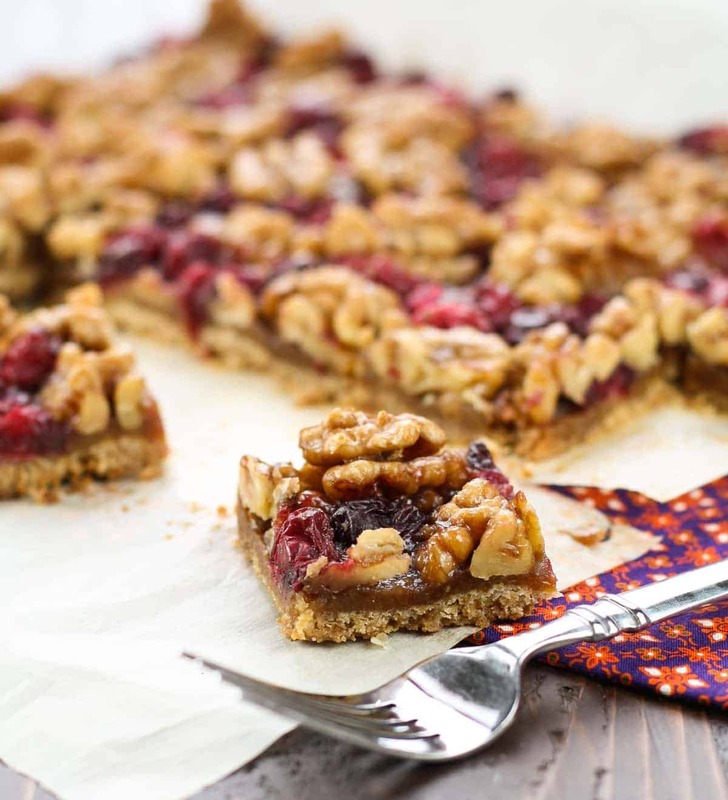 Imagine a pie filled with candied walnuts, tangy cranberries and a shortbread crust, and you have the essence of these bars. They are both rich-looking and rich-tasting, and they look so appetizing when cut into diamond shapes for a buffet. Another reason to love them? These bars can be made ahead of time and keep well for several days on the counter. Tip: Fresh cranberries are all over the grocery store right now, so buy a few extra bags and pop them in the freezer. They freeze beautifully and are the perfect pick me up for baked goods during the winter doldrums. A great food gift for the holidays! Preheat oven to 350 degrees. Line a 9 x 13 pan with enough parchment paper for a 2-3" overhang on the sides. Add butter, flour, brown sugar and salt in a medium bowl. Cut together using pastry blender (or two knives) until mixture looks like small peas. You can also grate frozen butter to achieve the same result. Pour shortbread into pan and pat down. Bake for 20 minutes or until golden brown. Combine butter, brown sugar and maple syrup in a saucepan over medium low heat. Stir until butter is melted and simmer for 1-2 minutes. Stir in walnuts and cranberries. Pour over shortbread base. Return to oven and bake until bubbly, about 20-25 minutes. Cool in pan before cutting bars. Can totally see why these would be a family favorite – what a classic holiday recipe! The holidays just aren’t the same without our faves, right? These are just soooo good! I’ve made cranberry and blueberry since they are in season now. I keep some in the freezer most of the time so I can pull some out every once in a while. Everyone I’ve given them to has loved them, too! Oooh, I love the blueberry spin, Sara! Will have to try that, too. Thanks for sharing! Cranberry bars are always a hit in my house. Those perfect walnuts on top look great. I also love ornaments, but choosing one is definitely tough. 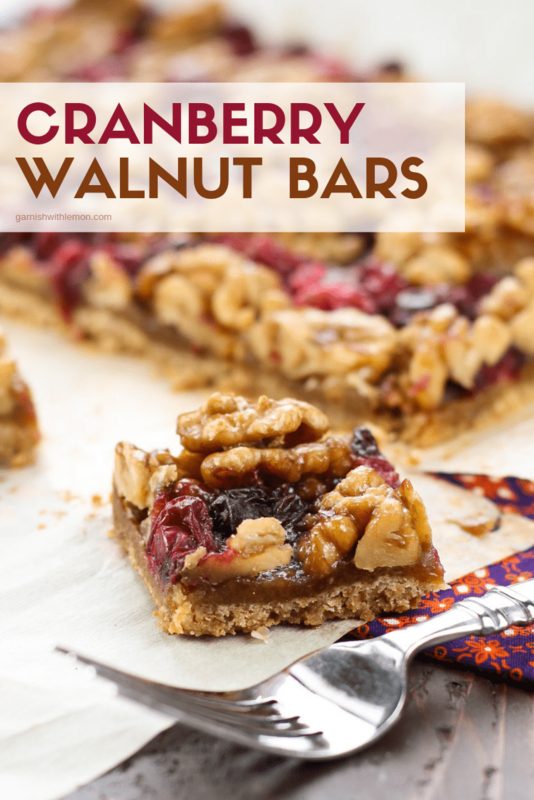 Yay for more cranberry walnut bar lovers!